Are you familiar with this patch? If you are a Patriot Guard Rider, you should be. It’s part of your heritage. This is the patch of the original Patriot Guard………..the one in Kansas. It’s a separate organization. 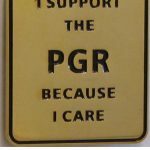 In a way, the Kansas Patriot Guard is the parent organization of the PGR. During the summer of 2005 things were “hot” in Iraq. The American Armed Forces were taking casualties. Sadly, there were young warriors coming home in flag covered coffins. There was also a group that I will not name that was travelling around the country disrupting and protesting at the funerals of fallen Heroes. At American Legion Post 136 in Mulvane, Kansas these events were being discussed. Mrs. Carol Houck, wife of American Legion Rider Terry “Dark Horse” Houck, suggested that some means to protect the families of the fallen be found. The men of that ALR post wen to work on the issue. What they developed was a response using motorcycles and bikers to shield families from the protests. Peaceful, lawful, highly effective. They wrote a mission statement and developed a mission structure and tactics that most of us still use. After several missions had been completed it became obvious that the need was of a continuing nature. They decided to officially create an organization and on October 18, 2005 they settled on a name for it…………. Patriot Guard. At the October 27, 2005 mission for SPC Lucas Frantz, Patriot Guard patches like this one were distributed to the assembled bikers who came to conduct the Honor Mission. One of those in attendance was Jeff “Twister” Brown. Twister saw the potential for the new organization to go national. On November 8, 2005 www.patriotguard.org went live and the process to appoint a State Captain for each state began. The Patriot Guard Riders is a national organization which conducts thousands of Honor Missions each year. So, when is the PGR birthday? I can answer that. It doesn’t matter. The only thing that does matter is that no American Warrior, living or dead, shall be disrespected. It shall not be. Should that begin to occur just stop and………..Listen for the Rumble.